Window treatments play a greater role than just covering the window. They add color, texture, and interest to any room. And they control the way light enters the room, which helps immeasurably with the aesthetics of the space. At A Shade Above serving Charlotte, North Carolina, our trained consultants will be happy to help you select the right treatment for your needs. With “open concept” floor plans, controlling light is different than in more closed spaces. Fabric selection certainly plays a big part controlling the light. So does how the blind or shade operates. For example, the Bottom-Up Only function is used for window treatments that are either raised up or closed most of the time. The Top-Down Only function is great for bathrooms or when you live on the first floor with heavy foot traffic. Both privacy and light are at your fingertips. The Top-Down/Bottom-Up feature meets all of your privacy needs while still giving you access to natural light. Finally, the Duolite™ feature offers maximum light control. Plus, it’s two shades in one. For example, the top shade is made out of a sheer fabric, and the bottom shade is made out of a semi-opaque or blackout fabric. When the top shade is down, the light is filtered. When the bottom shade is raised up, you have room darkening. 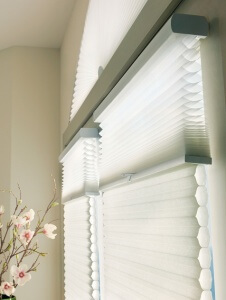 To Hunter Douglas offers the above operating features on many of their most popular window treatment, including Roman shades, pleated shades, Provenance® Woven Wood Blinds, Applause® Honeycomb Shades, Vignette® Modern Roman Shades, Duette® Honeycomb Shades, Pirouette® Window Shadings, and Silhouette® Privacy Sheers. Remember, no matter which product you choose, the style, color, and texture of your window treatment will add interest and so will how the light is controlled when it enters the room.